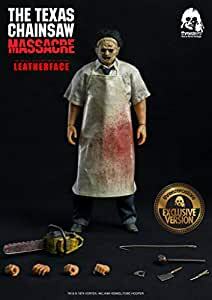 The Texas Chain Saw Massacre – 1/6 Leatherface collectible figure will be available for pre-order at www.threezerohk.com for limited time only, starting from October 27th 9:00AM Hong Kong time for 168USD / 1310HKD with Worldwide shipping included in the price. In addition we will have threezero Official Website exclusive version which comes with extra accessories for 178USD / 1385HKD with Worldwide shipping included in the price. All Leatherface collectible figures purchased at our online store will be coming with free t-shirt with threezero Horror Movie Heritage print. Please choose your preferred color and size during the purchase. Leatherface collectible figure stands approximately 12.6â (~32cm) tall, it’s fully-articulated and highly detailed collectible, featuring realistic likeness based on the 1974 cult horror film âThe Texas Chain Saw Massacreâ, Dark Fabric Hair Implantation and signature Gruesomely Authentic Sculpted Mask. Collectible figure comes with Tailored and Weathered Clothing: Necktie; Short Sleeve Shirt; Apron; Belt; Pants; Boots and variety of Weapons: Chainsaw, Hammer, Hook and Multiple Exchangeable Hands. 1/6th scale The Texas Chain Saw Massacre Leatherface Collectible Figure details: 12.6â (~32cm) tall Articulated Figure Featuring Tailored Clothing with Detailed Weathering; Incredible likeness crafted with lifelike accuracy based on the 1974 horror film âThe Texas Chain Saw Massacreâ; Dark Fabric Hair Implantation; Gruesomely Authentic Sculpted Mask. Featuring the following Clothing and Accessories: Necktie; Short Sleeve Shirt; Apron; Belt; Pants; Boots. Variety of weapons: Chainsaw; Hammer; Hook. Exchangeable Hands: One pair of Relaxed Hands; One pair for Holding weapons; One right Hand for Gripping Chainsaw. threezero Official Website Exclusive: Meat Cleaver; Knife; Pamâs Bracelet. * Final product may vary from prototype images.